It’s all about tablets this week as following on from Microsoft’s Surface reveal, Amazon today announces three new Kindle Fires -- the 7-inch Kindle Fire HD, and the Kindle Fire HDX, in 7 and 8.9-inch sizes. The new devices offer a slimmer design, better screens, faster hardware and an updated OS. The $139 Kindle Fire HD has a high-definition display with 1280 by 800 resolution and 216ppi -- 66 percent more pixels than the previous generation Kindle Fire. It’s powered by a dual-core 1.5 GHz processor, and has dual stereo speakers with Dolby Digital Plus audio. The Kindle Fire HDX is a faster, more powerful version of last year’s Kindle Fire HD and comes in two sizes: 7 inch for $229, and 8.9 inch for $329 (add a further $100 to the price if you want a 4G connection from AT&T or Verizon Wireless). The 8.9-inch model offers a 2560 by 1600 screen with 339ppi. The 7-inch device by comparison has a 1920 by 1200 display with 323ppi. Amazon says the colors are more accurate and the screens offer dynamic image contrast, and improved brightness for better viewing in any lighting conditions. The HDX is powered by a 2.2 GHz quad-core Snapdragon 800 processor, and packs 2GB of RAM and an improved Adreno 330 graphics engine. 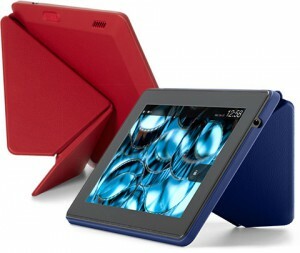 The larger tablet, which weighs 13.2 ounces, also sports an 8-megapixel camera on the back. Both sizes have front facing HD cameras. Amazon says the Kindle Fire HDX will offer 11 hours of battery life for normal use, and up to 17 hours if you’re using the tablet purely for reading. Both tablets come with the latest version of Amazon’s Android-based OS -- Fire OS 3.0 "Mojito" -- with hundreds of new and upgraded features, platform updates, and Amazon-exclusive services such as X-Ray for Music (no more misheard lyrics! ), Prime Instant Video downloads, Second Screen, expanded X-Ray for Movies and TV, and more. The Kindle Fire HDX also has a new Mayday button in Quick Settings which will connect you with an Amazon expert to provide help and assistance. Mayday is free and available 24x7, 365 days a year. Both devices also come with new Origami cover which allows you to stand them up in both portrait and landscape modes. The cover attaches magnetically so it’s easy to put on and take off. All three tablets are available to pre-order from today. 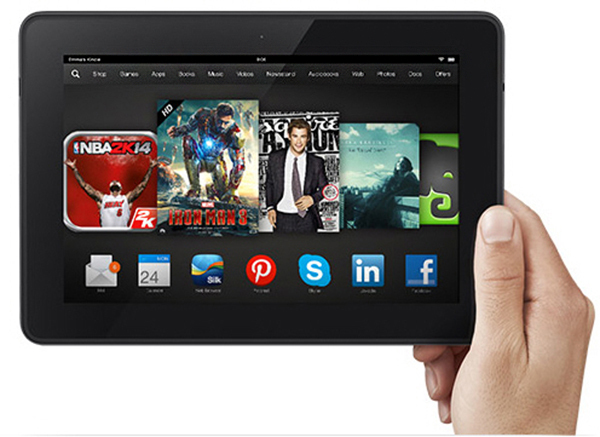 The Kindle Fire HD will ship 2 October, the 7-inch HDX on 14 November and the 8.9-inch HDX on 10 December. No word on availability in other countries yet.